Living in Dublin since 2008, the home of Guinness, the world famous stout pretty much becomes part of your life. Even if you don’t make regular trips to a pub to have the perfectly pulled pint, there are Beef and Guinness savory pies and all sorts of other ways to enjoy this liquid black gold as it is lovingly referred to over here. 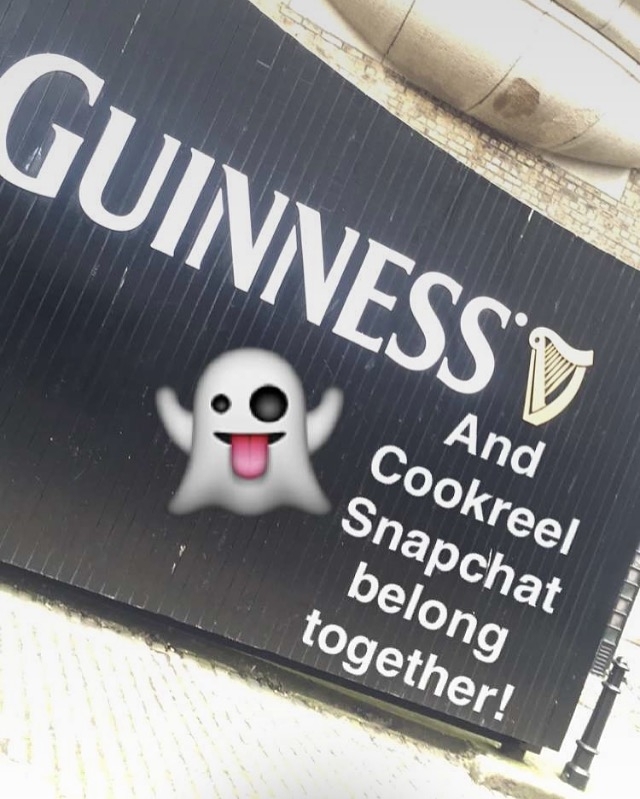 While we are currently in London, since I was back in Dublin this week I thought it was a must to make a visit to the Guinness Factory for my weekly episode of the Cookreel Snapchat takeover (the story will be up for 24 hours so go over to @cookreel to check it out). Oh and of course there had to be a culinary creation too! 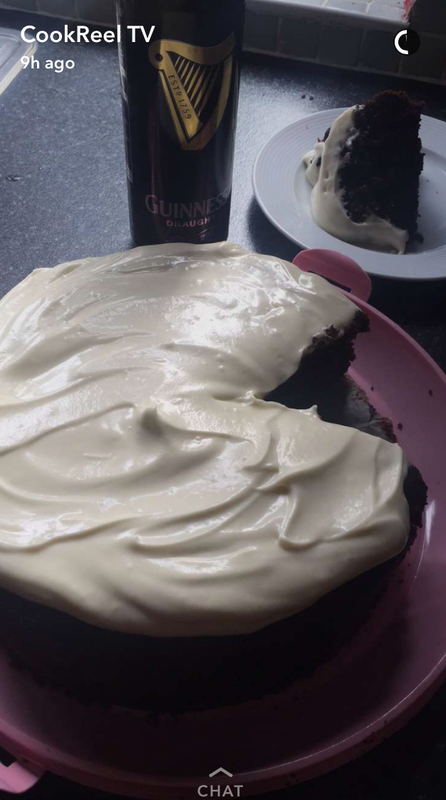 So why not have Chocolate Guinness Cake? YUM! For years Guinness ads have touted the goodness of the drink even recommending it to people with low iron in their blood. While I won’t say Chocolate Guinness Cake is good for you, a cake made from scratch with real ingredients would be much nicer than some sort of prepackaged one. At least you know what is going into it and they are words in the ingredients list you can pronounce. 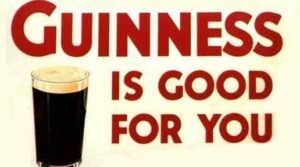 And since Guinness is literally the number one stout in the world, I think we are pretty safe most would be able to say that word! Even if they don’t drink it themselves this brewery started in 1759 here in Dublin is known in all parts of the world. There is a world records book that comes out each year called The Guinness Book of World’s Records! I think I might be in it for eating the most chocolate in the world, it’s my fav. So this recipe will be a massive hit for any chocolate lovers like me! Preheat the oven to 170°C /325°F/gas mark 3. Line the base of a 30cm round spring form tin with baking parchment. To make the cake, heat the butter in a large saucepan over a medium heat until melted. Stir in the Guinness, then remove from the heat and stir in the cocoa powder. 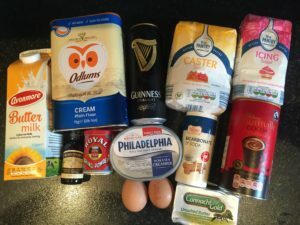 In a large mixing bowl, whisk together the eggs, sugar, vanilla essence and buttermilk and then slowly add the Guinness mixture, whisking all the time. In a separate large bowl, sieve together the flour, bicarbonate of soda and baking powder. Using an electric whisk, slowly pour the wet mixture into the dry ingredients and keep whisking until it is all well combined. Transfer the mixture in to the cake tin and bake for approximately 45 minutes. Test to make sure the cake is cooked by inserting a toothpick into the middle of the cake – if it comes out clean, the cake is cooked. Set aside to cool a little, and then remove from the tin and allow to cool completely on a wire rack. Meanwhile, make the icing by blending all the ingredients together using an electric hand whisk until light and fluffy. Place the cooled cake on a plate and generously spread the icing on top. The cake will keep for up to 1 week in an airtight container. My dear friend Lauren was so kind to let me use her kitchen and baking gear to get the cake baked. And while it was cooling I went on the tour of the Guinness Factory, which was a blast. I always take out of town guests there. It is like Disneyland for adults. 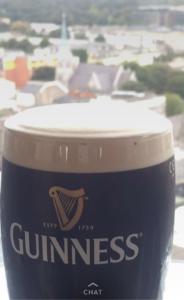 I took the pic on the left of my pint of Guinness a top the factory at the Gravity Bar. And that foam on top was great inspiration for the delicious cream cheese topping that I put on the cake when I returned to Lauren’s. 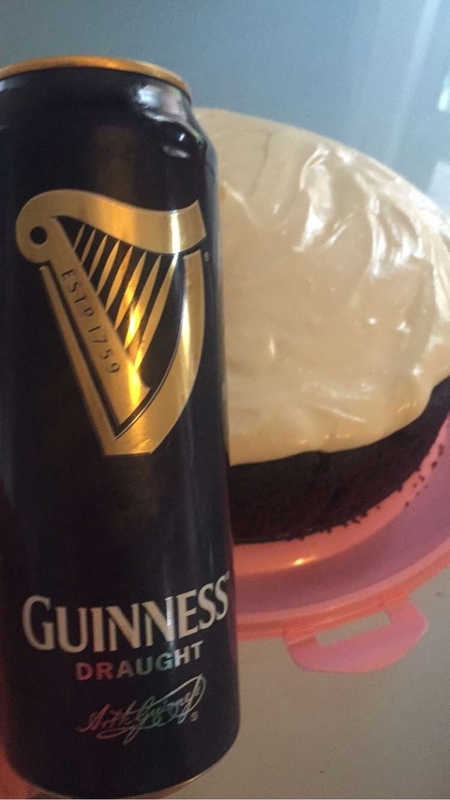 I usually make my own Guinness cupcakes with a Baily’s Irish Cream frosting, but for this special day, a full cake was in order. I used a recipe from one of my Woman Crush Wednesday recipients, Clodagh McKenna. I saw her recently at a Supper Club in London she hosted and that I attended with a Snap Sista (Miriam from Bake My Style). And Clodagh specifically asked me to try the cake and let her know how I got on with it. Well, it was a smashing delicious success. Super easy to make and the cake was very moist and moreish! I only wish I could have taken nicer photos. But until I make it again, why don’t you try it and let me know how you do with it? Let’s say that there is only one small piece left! Though Lauren and I didn’t devour it! I was chaffing for a Supper Club of my own last night and this was one of the desserts! It was a great way to end a fantastic day! Thanks once again Cookreel for the opportunity to host your snapchat channel, thanks Clodagh for the recipe, thanks to Lauren for your friendship (and kitchen) and mostly thanks to Ireland for being so special to me! My soul home forever! P.S. My own Snapchat username is blissbakery so come on over for some daily foodie fun!